I have been known to, a time or two, snag my husband’s phone out of his hand if he attempts to check a text or email while behind the wheel. Rude, I know, and he really hates it. But distracted driving is real and the effects of distracted driving are devastating. For the record, I used to be, perhaps, one of the worst offenders of texting/emailing and driving. I actually thought time on the road was synonymous with office time. What better time to get caught up on all those emails I never had a chance to return while at my desk? In recent years, I have learned the error of my ways and now make a conscious effort to put my phone away while behind the wheel. Admittedly, I am a work in progress. I still occasionally find myself reaching for my phone – especially if I’m alone in the car or if I’m stopped at a red light. Recently, I’ve been looking at safe-driver apps in an effort to work harder at reminding myself to not pick up my phone while behind the wheel. There is some sort of irony built in to this task. I am searching for and loading apps on the exact device that I am attempting to not utilize in an effort to track and therefore reward my lack of utilization of said device during specific activities. So, I found and downloaded three such apps – Allstate Drivewise, AT&T DriveMode® and LifeSaver. Why three instead of just one? Good question. First, I hate to admit it, but I am not exactly techno-savvy. I figured, out of three, I’d get at least one to effectively work to my benefit. Second, in addition to benefiting from the use of such apps, I thought this would make a fantastic blog topic. Boy was I right. Just wait … you’ll see. Before getting into by personal experience and/or opinion, here’s a quick summary of all three apps. Allstate Drivewise – upon my initial review, this seemed very simple. Load the app and drive. You are awarded points for driving safely and the points can be redeemed for various items, including merchandise and gift cards. AT&T DriveMode® – again, this seems very easy. Load it and go. Anytime it detects you are traveling faster than 15 miles per hour, it automatically turns on and then turns off shortly after stopping. LifeSaver – runs constantly in the background. Once you’ve loaded the app, there are some simple set-up steps you need to do, but then, as long as you leave it running in the background, it’s ready to go. 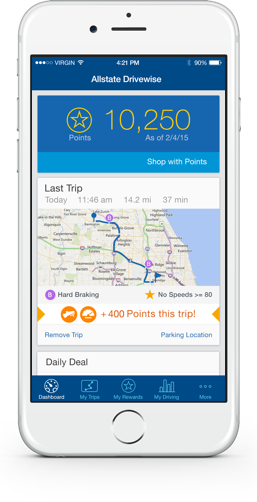 Of the three apps, Allstate Drivewise is definitely my favorite. It has a dashboard report of your trips, including the time of day, the risk associated with driving during that time of day, total miles driven, speed driven, hard brakes, etc. Plus, the number of points it awards for being a good driver is huge. On my very first trip with the app installed I earned 10,000 points. AT&T DriveMode seems to have some great features, but you need to be an AT&T customer to take full advantage of all of them. My cell phone carrier is not AT&T, so choosing to test DriveMode was probably not my best option. For people with AT&T and teen drivers, however, this would definitely be worth a look. My least favorite was LifeSaver. Here’s why – it is the most annoying, distracting, irritating application on the face of the earth. I didn’t need to be concerned with family and friends reaching out to me because the app messages me constantly while I’m driving. Don’t try turning it off – it will message you repeatedly to turn it back on. And when you attempt to utilize the passenger override feature, it ignores you. Or doesn’t believe you. Or both. I promised that I would give this test a full 30 days. At the end of this 30 days, I can honestly say the best part about LifeSaver will be deleting it off my phone. I only hope that it won’t then message me to reload it.